Anne Lynch Botta (1815 -1891) lived in DC from 1850 to 1853, while serving as personal secretary to Henry Clay. She is the author of Poems (1849) and A Handbook of Universal Literature (1860, a widely used textbook), and editor of an anthology, The Rhode Island Book. Born in 1815, Botta was educated at the Albany Female Academy, and taught briefly in Albany and Providence, RI. 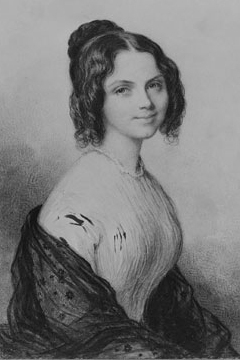 After her sojourn in DC, she settled in New York, teaching at the Brooklyn Girls’ Academy, writing freelance articles for magazines, and hosting a renowned salon in her home, frequented by some of the most famous writers of the time, including William Cullen Bryant, Edgar Allen Poe, Helen Hunt Jackson, Margaret Fuller, Ralph Waldo Emerson, Horace Greeley, and Fanny Kemble. In middle age, she married a Dante Scholar who taught at New York University. After her death in 1891, her husband compiled her unpublished poems, along with letters and tributes, and published the posthumous Memoirs of Anne C. L. Botta: Written By Her Friends (1893).